Hi guys. I know about the whole log thing but my issue is everything I do it shuts down in 4 seconds. I can not do a Hijack log. Here's my problem. Everything I hit comes back with either "Windows cannot access the specified device, path, or file. You may not have the appropriate permissions to access the item." Or, at the bottom of the page I get that virus scan you don't want that blocks all .exe files. I know some about computers and this is what I did so far. 1. Back doored my way back online by blocking the virus process "defenders". However, there has to be more to this because every time I run a cleaning program and whether or not I reinstall it or not, it quits after 4-5 seconds even with that processed blocked. I even tried changing Malwares name to winlogon.exe both before and after I re-installed the program but that did not help. 2. Did the whole safe mode thing but it resulted in same results. 3. I can't do a system restore because it only has the present day as log points. 4. Went into msconfig and loaded just the basic stuff but it still resulted in the same results. 5. Downloaded virus scans on another computer and converted them by flashdrive to the virus one but it still netted the same result. I don't want to reinstall windows if I don't have to. My computer is old, a Dell Inspiron B130 from 2006. The last time I had a problem and reinstalled windows it was a mess because it came back working but the computer couldn't identify the product key. Any help would be greatly appericated. Thank you very much. Don't know if this means anything but in the processes I have something suspicious thats only a number 401932336:3489..... System. I took a gamble thinking that was the other part of the virus and hit end process but it won't remove. Don't know if that is of some help but I'm trying to give you as much info as I can. Please follow the directions in the order given.. Please download DummyCreator.zip and unzip it. 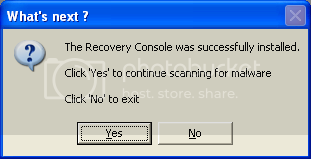 Right after the reboot run the following tools.Right after the reboot try and run the following tools. Be sure to download TDSSKiller.exe (v2.5.6.0) from Kaspersky's website and not TDSSKiller.zip which appears to be an older version 2.3.2.2 of the tool. A log file named TDSSKiller_version_date_time_log.txt (i.e. TDSSKiller.2.5.6.0_27.07.2010_09.o7.26_log.txt) will be created and saved to the root directory (usually Local Disk C .
2011/09/01 14:11:43.0953 1816	Backup copy found, using it..
Ok, I still have to beat the defenders.exe process in taskmgr before it starts to gain access to online service. Without that, it still shuts everything down. Im going to do the combofix now. I'll let you know when done. Thanks for all of your help. I'm a bit nervous about using combofix. Ill wait til you respond before I do it. Go ahead and use Combofix. Hi, looks like Combofix did the trick. Thank you. Here's my log you ask for. Is Panda security a malware program? c:\program files\Lavasoft\Ad-Aware 2007\aawservice.exe . . . is infected!! c:\program files\Common Files\Apple\Mobile Device Support\bin\AppleMobileDeviceService.exe . . . is infected!! c:\program files\Bonjour\mDNSResponder.exe . . . is infected!! c:\windows\system32\dlcgcoms.exe . . . is infected!! c:\program files\Java\jre6\bin\jqs.exe . . . is infected!! c:\program files\Dell\QuickSet\NICCONFIGSVC.exe . . . is infected!! c:\program files\Panda Security\Panda Internet Security 2009\PsCtrls.exe . . . is infected!! c:\program files\Panda Security\Panda Internet Security 2009\PavFnSvr.exe . . . is infected!! c:\program files\Common Files\Panda Security\PavShld\pavprsrv.exe . . . is infected!! c:\program files\panda security\panda internet security 2009\firewall\PSHOST.EXE . . . is infected!! c:\program files\Panda Security\Panda Internet Security 2009\PsImSvc.exe . . . is infected!! c:\program files\Panda Security\Panda Internet Security 2009\PskSvc.exe . . . is infected!! c:\program files\Viewpoint\Common\ViewpointService.exe . . . is infected!! c:\windows\System32\WLTRYSVC.EXE . . . is infected!! c:\program files\Yahoo!\SoftwareUpdate\YahooAUService.exe . . . is infected!! Panda is not Malware. However in your case the malware that was on your machine did infect Panda Security files. I would uninstall then reinstall Panda to make sure it is working properly. Lets run a couple other scans to make sure nothing is leftover. Congratulations! You now appear clean! Make sure that Combofix.exe that you downloaded is on your Desktop but Do not run it! o *If it is not on your Desktop, the below will not work. Now copy & paste the green bolded text in the run-box and click OK.
"This will uninstall Combofix, delete its related folders and files, reset your clock settings, hide file extensions, hide the system/hidden files and resets System Restore again. It also makes a clean Restore Point and flashes all the old restore points in order to prevent possible reinfection from an old one through system restore". You may wish to try StartupLite. Simply download this tool to your desktop and run it. It will explain any optional auto-start programs on your system, and offer the option to stop these programs from starting at startup. This will result in fewer programs running when you boot your system, and should improve preformance. If that does not work, you can try the steps mentioned in Slow Computer/browser? Check Here First; It May Not Be Malware. Below are some recommendations to lower your chances of (re)infection. If you wish, the commercial version provides automatic updating. You can use the HostMan host file manager to do this automaticly if you wish. Malware Byte's Anti Malware is an excellent Anti-Spyware scanner. It's scan times are usually under ten minutes, and has excellent detection and removal rates. SUPERAntiSpyware is another good scanner with high detection and removal rates. Both programs are free for non commercial home use but provide a resident and do not nag if you purchase the paid versions. Keep Windows (and your other Microsoft software) up to date! I cannot stress how important this is enough. Often holes are found in Internet Explorer or Windows itself that require patching. Sometimes these holes will allow an attacker unrestricted access to your computer. Visit the Microsoft Update Website and follow the on screen instructions to setup Microsoft Update. Also follow the instructions to update your system. Please REBOOT and repeat this process until there are no more updates to install!! On the left, choose "Change Settings"
Ensure that the checkbox "Use Microsoft Update" at the bottom of the window is checked. Press OK and accept the UAC prompt. Note: You shouldn't need to check this checkbox every single time you update, only the first time. Click "Check for Updates" in the upper left corner. Follow the instructions to install the latest updates. Software does not need to be made by Microsoft to be insecure. You can use the Secunia Online Software occasionally to help you check for out of date software on your machine. The MOST IMPORTANT part of any security setup is keeping the software up to date. Malware writers release new variants every single day. If your software updates don't keep up, then the malware will always be one step ahead. Not a good thing .